Raise at least $75 to Plunge, $50 for Junior Plungers. Sign up on-line and start raising money today! Get ready for the Chill of a Lifetime! Join us for the Polar Plunge for Special Olympics.Raise a minimum of $75 (or $50 for Polar Bears under 18) and take a chilly dip into a pool that will be set up in the Texas Roadhouse parking lot. Prizes for the top individual fundraiser and for the top fundraising teams in corporate/civic, school and law enforcement divisions. There are also prizes for the best individual and group costumes. 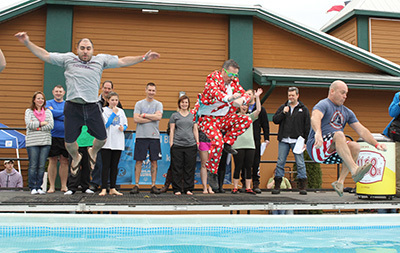 Can’t plunge, but still want to support Special Olympics? No problem. Register as Too Chicken to Plunge. You get a special Too Chicken shirt and are eligible for all other fundraising awards. Either way, you’ll be Freezin’ for a Reason!